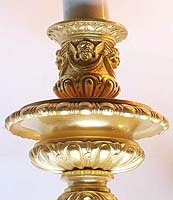 The Spelling Manor's Dining-Room Wall-Lights. 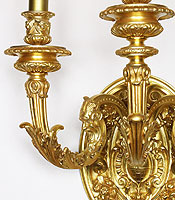 A Very Fine Pair of French 20th Century Louis XV Style Gilt-bronze Figural Three-Light Wall Sconces, each with a circular coat-of-arms back-plate centered with a Royal shield and relief details of fruits, acanthus and scrolls, the two outer candle-arms modelled with male-masks and the candle bobeches with detailed relief figures of cherubs. Circa: Paris, 1920. 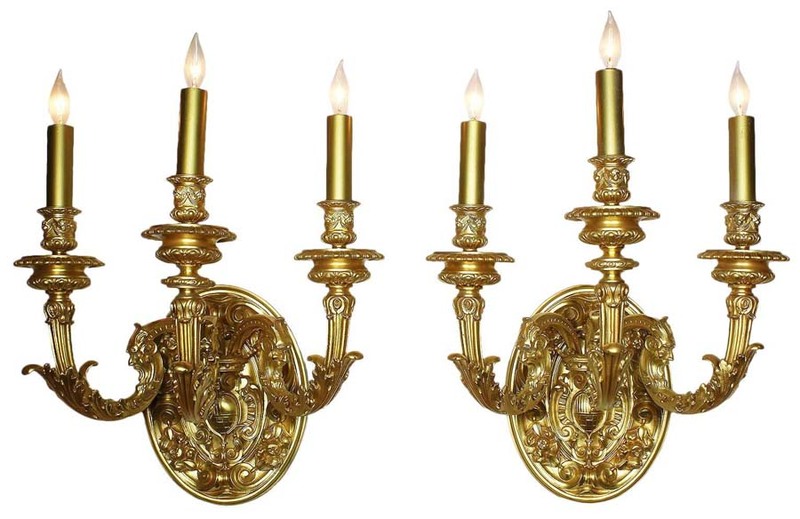 These pair of wall lights were removed from The Spelling Manor, the luxurious 57,000 square foot sprawling estate in the exclusive Holmby Hills neighborhood of Los Angeles, California, the French Château style residence which sits on 4.7 acres was built in 1990 by the late legendary TV producer Aaron Spelling for his wife Candy. In 2011 The Spelling Manor was sold by Mrs. Spelling to Ms. Petra Ecclestone, the daughter of Formula One billionaire Bernie Ecclestone, for a reported $85 million dollars. 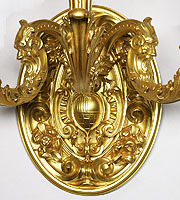 It is one of the largest private residence in Los Angeles, even larger than the White House and, at the time, it was catalogued as the most expensive home in the United States. The Spelling Manor's Dining-Room Wall-Lights. 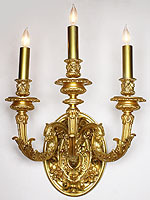 A Very Fine Pair of French 20th Century Louis XV Style Gilt-bronze Figural Three-Light Wall Sconces, each with a circular coat-of-arms back-plate centered with a Royal shield and relief details of fruits, acanthus and scrolls, the two outer candle-arms modelled with male-masks and the candle bobeches with detailed relief figures of cherubs. Circa: Paris, 1920.